Better late than never to worthy discoveries. I tried my first wine from 90+ Cellars earlier this summer: a friend had brought one of the company’s Sauvignon Blancs to a backyard barbecue. But was it the Lot 64 from northern California’s Lake County, or Lot 2 from New Zealand? I didn’t know enough about 90+ at the time to pay attention. Either way, though, it was nice and, I was told, not expensive. Later I read up on 90+ Cellars’ story; they’ve certainly garnered great publicity since launching in the recessionary days of mid-2009. Looking for great wines at decent prices, the Boston-based company’s founders sought out highly-rated wineries with unsold product that were willing to have their wine bottled under the 90+ Cellars label, at prices (mostly under $20) below what the original winery names could have commanded. In Hoboken, the small but well-stocked Garden Wine & Liquor sells a wide array of 90+ varieties. Garden Wine owner Phil said they’ve proved a huge winner for the store, so he displays them prominently near the entrance. The reds on recent offer included a Malbec from Lujan de Cuyo, a Pinot, several Cali Cabs, a Bordeaux, and more. Among the whites: that Lot 2 from New Zealand, a Pinot Grigio from Trentino, “French Fusion White” from Languedoc. 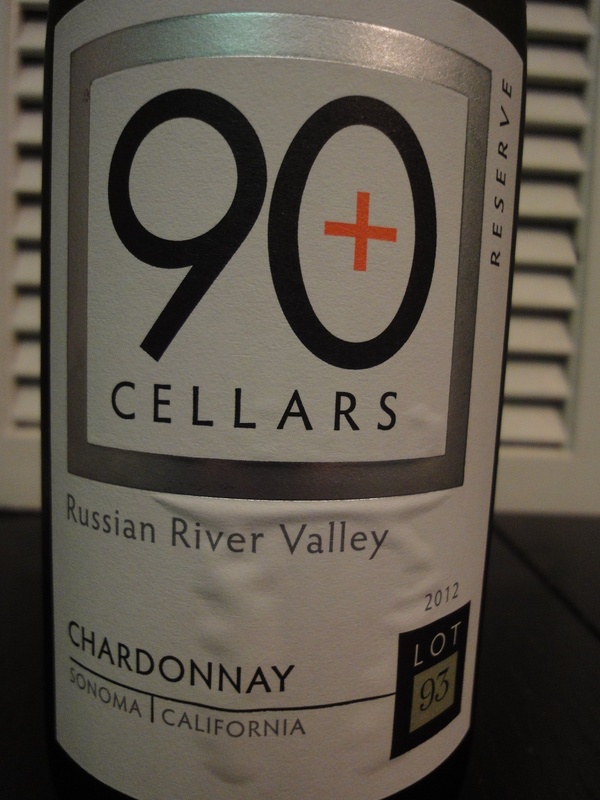 For $15, I took home a bottle of Lot 93, a 2012 Russian River Chardonnay, 700 cases made. What did I think? In the glass, the wine is quite pale, implying Pinot Grigio or Sauvignon Blanc. The nose suggests mineral, citrus and a hint of cheese. It’s a high-alcohol Chardonnay (14.5%) but doesn’t drink like one. I enjoyed the first sips, but the wine didn’t hit its stride until it had opened up for half an hour. 90 points? I’d give it 89. This entry was posted in Odds & Ends, Shopping, Tasting and tagged 90+ Cellars, negociant, wines under $20. Bookmark the permalink.